Safety in the workplace is important regardless where you clock in every day, but it's especially important to master when your professional environment regularly contains hazardous particulates, harmful chemical vapors or radionuclides. Even basic microbiological work has some associated risks, as oftentimes it is not only necessary to protect the person sitting at the face of the cabinet but the science taking place inside on the work surface. It's with this eye toward protection that laboratories have rightfully turned to employing the use of biosafety cabinets, allowing their technicians to properly and safely handle biosafety agents requiring BSL 1-3 containment. That just scratches the surface, so we decided to dig a little deeper and get the input of an outside industry expert to talk about the true meaning of creating a culture of safety for biosafety in laboratories and how that relates to leadership. That expert is Sean Kaufman, CEO of Behavioral-Based Improvement Solutions. Sean's approach to the biosafety industry is truly safety-centric, and his knowledge has been called upon in various high profile circumstances including the 2001 Anthrax attacks and SARS outbreak. He has testified in front of Congress about infectious diseases and, in 2014, prepared the clinical staff at Emory Healthcare to respond to the first cases of Ebola on American soil. He then traveled to Nigeria and Liberia to prepare healthcare workers there to do the same. So, let's just say Sean knows his stuff when it comes to biosafety. While his background is diverse, his message is simple: safety matters. We jumped at the opportunity to ask him a few detailed questions—read on to learn how to create a culture of safety and why it's important. Q: To start, can you describe a little bit of what you do? A: I'm a behavioral psychologist focusing on infectious disease. Biosafety cabinets are pieces of equipment—very vital pieces of equipment—but I focus on human behavior with and around them. You can spend thousands and thousands of dollars on a cabinet, but all the control can be negated in an instant with inappropriate behavior. I don't think the need for biosafety cabinets is any longer debated. They're one of the best engineering controls we have in biosafety today. There are lots of complexities, but the workforce needs consistent investment in preparing them to effectively work in a cabinet—that’s where I'm an advocate. Q: Let's start dissecting those complexities. 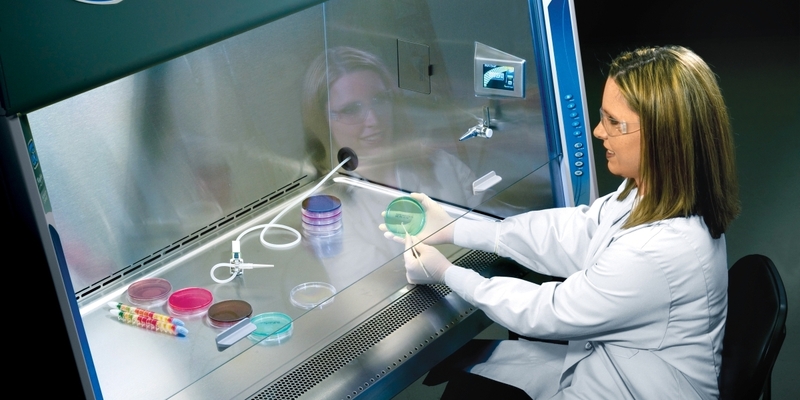 There are so many considerations when it comes to biosafety cabinet selection. How do you begin to conduct risk assessments, and why are they important? A: That's a big question. When you look at a biosafety cabinet, the first and most basic thing you have to do is determine what you're going to be using it for. Then, decide how much workspace you need. Are you going to be working with animals? What type of connection does your science require—are we talking recirculated A2 or thimble connected A2? Maybe you'll need a fully ducted B? From a big picture perspective, we look to make sure the cabinet is certified, it is functioning properly and it passes a smoke test. If all those are in check and you've chosen the appropriate equipment, the biosafety engineering aspect has been done for you. Now you must operate safely within the enclosure. Q: So, after selecting a biosafety cabinet, what comes next? A: It's absolutely critical to train employees because they are the human interface of the biosafety cabinet, of that engineering control. Leaders need to train them how to choose appropriate personal protective equipment and develop standard operating procedures (SOPs) that answer real questions. How do we set things up and break them down? In my opinion, by the way, the cabinet should be broken down and cleaned at the end of each night. What type of disinfectant are we using? How are we going to deal with corrosives? Are we working from clean to dirty? The risk assessment list goes on and on, but having effective, tested and validated SOPs is critical throughout the life of the cabinet. When there are standard, easy to follow checklists in place for routine operations, some of those processes can be streamlined and the risks minimized. Q: As a behavioral psychologist, I think you're more qualified than anyone to answer this next question: Do you feel ergonomics play a role in safety in the laboratory? A: Absolutely—but I have my own philosophy on that. 3. They promote the workforce. When you look at the words 'prepare the workforce,' preparing means that they give the workforce the resources they need to do the job and to do it well. That’s where good biosafety cabinet ergonomics come in. These technicians are dealing with long hours at the bench, and you have to consider posture, arm position and a number of other behaviors that can affect how safe the work actually is. Adequate preparedness is critical in the workforce, and that's a leadership responsibility. Q: Can you explain in greater depth the role of ideal leadership in the laboratory and how that relates to safety? A: To me, biosafety cabinets are phenomenal engineering devices. However, the minute they come in contact with a human exhibiting human behaviors, that person better be trained or the cabinet could risk losing its protectiveness. Again, that's a leadership thing. You can't just give someone a biosafety cabinet and say, 'go work.' You have to train them how to use it. Some technicians tend to over-rely on the engineering aspects of the cabinet. It's great that they're working in them, but they might botch the glove removal process or become lax at disinfecting. That's how we have instances of individuals coming out of biosafety cabinets and contaminating other areas of their laboratories. The workforce is supposed to follow some very clear expectations. Even if they were to follow all of them, leadership still has a responsibility to the workforce. Guidelines and policies bring us together, but being together and doing together are very different things. Everyone has to be on-board with safety in order for it to work, and that starts at the top. Sean Kaufman spoke before Congress on safety in the laboratory as it pertains to the anthrax incident of June 2014 at the Center for Disease Control. Download the free 39-page ebook, "Biosafety Cabinet Management: Beyond the Basics"